This profusely illustrated volume illuminates the primacy of icons in disseminating the worship of the Medicine Master Buddha (J: Yakushi Nyorai) in Japan. Suzuki’s meticulous study explicates how the devotional cults of Yakushi, one of the earliest Buddhist cults imported to Japan from the continent, interacted and blended with local beliefs, religious dispositions, and ritual practices over the centuries, developing its own distinctive imprint on Japanese soil. Worship of the Medicine Master Buddha became most influential during the Heian period (794-1185), when Yakushi’s popularity spread to different levels of society and locales outside the capital. The large number of Heian-period Yakushi statues found all across Japan demonstrates that Yakushi worship was an integral component of Heian religious practice. Medicine Master Buddha focuses on the ninth-century Tendai master Saichō (767-822) and his personal reverence for a standing Yakushi icon. The author proposes that, after Saichō?s death, the Tendai school played a critical role in popularizing the cult of this particular icon as a way of memorializing its founding master and strengthening its position as a major school of Japanese Buddhism. 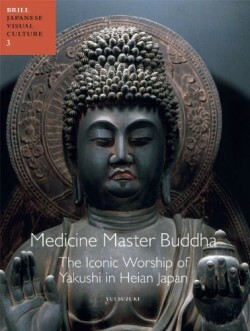 This publication offers a fresh perspective on sculptural representations of the Medicine Master Buddha (including the famous Jingoji Yakushi), and in so doing, reconsiders Yakushi worship as foundational to Heian religious and artistic culture. Yui Suzuki, Ph.D. (2005) in Art History, University of California, Los Angeles, is Assistant Professor of Art History at the University of Maryland. She has been teaching at UMD since 2006, and is a specialist in Japanese Buddhist art.